One of the most expensive element of the design is a stylish decorative curtain. Unnoticed, you can spend thousands of dollars just to get a good quality and beautiful curtains. However, there is one easy way to get curtains look beautiful with a relatively cheap price, that is done by decorating it by yourself. You can create your own special display your curtains by adding trim, or even a way of combining two different curtain to create a new impression. The first way, add trim with striking colors on your white curtains. Then, the “paste” little material with striking colors to get a unique look to your curtains. Use rings and retaining steel with black curtains to make your curtains more dramatic. Do not be afraid to try bright colors. 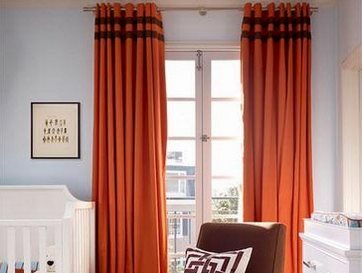 In addition to white, use orange curtains with dark brown trim. Black and white, white-green and gray can be a unique choice for your creativity. The second way you can do using thicker piping for your white curtains. Choose piping with a specific pattern to give the impression that you want. For example, you can choose piping with the typical pattern like batik. The third way is to combine two or more types of materials. Use a thin translucent fabric curtains and fabric upper with a matching thicker material underneath. Use cream color to get an impression of elegance and light to your room. Another trick to try to give the impression of “wow” on your curtains is to put a long curtain. Let the curtains meet all your walls from the ceiling down to the floor. Curtains as this will add to the impression of high narrow space.